Going into 2014, rayhomdotcom will continue as my blog to maintain my social networking relationship with my fellow family/friends and supporters about the going-ons in my meager life to pursue fulfilling enjoyment. My current “to-do” list consists of stuff I should have done a long time ago (who isn’t in the same boat? we’re an unsatisfied species). The fact that this post is written about 3 months into the year may not be a good sign of my habits. But, in my defense, I’ve been able to experience a bit of Life in previous weeks since Jan 2014 – highlights include having attended Vegas for CES and AVN, checked out Concord Comic-Con (yes, there’s such a thing), listened to Dr. Michio Kaku speak live in person, watched all nine of the 2013 best pic Oscar noms before the Academy Awards aired, and attending various CAAMFest screenings. In addition to all these self-pleasure moments, but not including my regular 9-to-5 or any charitable contributions I may have participated in, I sleep at an average of 5 or 6 hours/day, health is somewhat robust, and an exercise habit yo-yoing from consistent to “gotta get through it”… In retrospect, I barely did sh!et! Some may have read / heard me speak of some interests in A.I. (artificial intelligence) or my love of the “Terminator” (or “Robocop“, or “Battle Angel Alita“, or “Ghost in the Shell“) series… or a fascination with how Man will one day integrate with Machine. (I also wish to take a flight into space some day but my fear of heights on plane rides are grueling as they are now. So, unsure if space exploration will happen for me, unless I Google and take advantage of some good resources to cure my acrophobic anxiety issues.) I’m intrigued by the ideas of body enhancement through technology & medication, including life extension… remember that Man use to live beyond no longer than his 30s back in the earlier Eras. So, we’ve all been modified. I’ve already had my DNA analyzed by 23andMe in hopes to map out my genealogy. This is in order so that I have historical context on how far I can take my Life, and the generations after me. This is what has mostly been referred to as the Singularity. This is where most of my Philosophy of Life resides. Most of it is theoretical stuff, with scientific experiments to back it up. I’m unsure how close to having the ability to extend our lives by the year 2045, as predicted by Ray Kurzweil, will come to reality. But, we are living in an age where people speak of living past 100… maybe even up to 150 or 200, as advances in technology occurs. Some may say this is wishful thinking, the desire to live forever. All this may even borderline on a “religious fervor”. I assure you, that isn’t me. Whether I live to 100 or beyond, I don’t know. But as science improves human existence (it’s the only proven tool that does), this adds to my knowledge base to increase my chances of living a fulfilled life. I am a Futurist, and have an interests in the “Transcendence of the Human”. We are a flawed, imperfect species. We constantly battle for the philosophical, moral, and betterment of Humanity, and this is where my logical path takes me. But, I can not wait for April 6th, 2014. I am currently in the process of building a “Game of Throne” shelf. Ever since I got to meet the “god-like” George R.R. 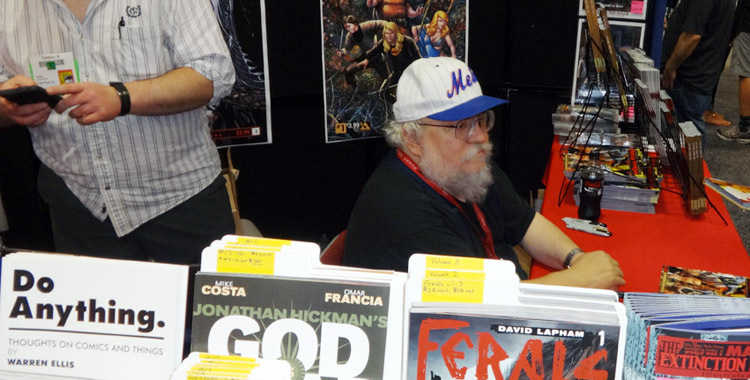 Martin last year at San Diego’s Comic-Con 2013, and had him sign a copy of the first book in the “A Song of Ice & Fire” series, I felt a need for a GoT shrine to worship. 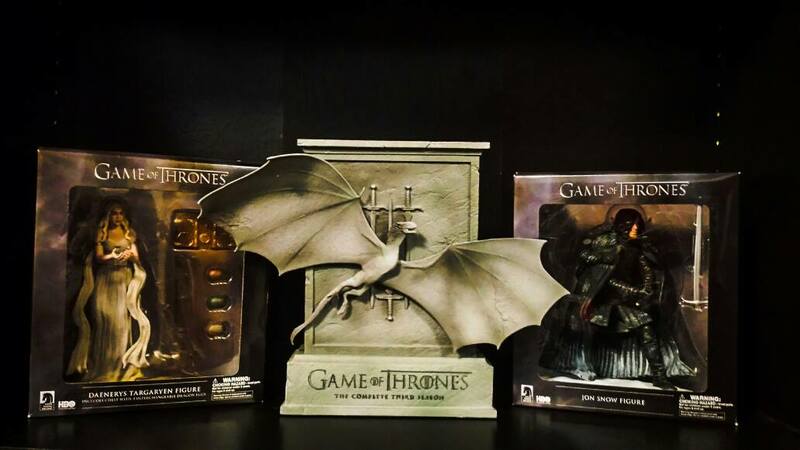 Besides the books, I got my hands on on the Dark Horse figures, direwolf bookends, dragon eggs, and a 7″ replica of the Iron Throne. (Full-size throne is being saved up for.) I’ve been slow with the book reading, as anyone knows, them books are thick-as-fawk. I’m almost done with Book 2: A Clash of Kings, and leading into Book 3: A Storm of Swords. I know GoT S3 and S4 are two halves of Book 3. If I can finish that book before S4 ends, I’m in good fanatical standing. I was never a big fan of fantasy, even though I grew up playing D&D/AD&D and other fantasy RPGs… read “Choose Your Own Adventure” books, collected miniature, metal figures (unpainted). The worlds of Harry Potter and LOTR only appeal to me as entertainment, they are not worlds I would choose to inhabit my life in. Science fiction worlds suits me more with my desire for simulated, alter-worlds. Hence, my fascination as a Futurist. But, Westeros, the land that is the “Game of Thrones” and the “Songs of Ice & Fire” series, now that is a place I’d like to live in despite the risk of being beheaded or massacred by White Walkers. GoT is exceptional fantasy because the characters are mature and rendered with realistic human qualities. None of them are perfect and have ego-driven/selfish motivations. They live in lands where magic is a hard-earned, painful discipline to achieve, and is not used as a plot device of convenience. And, yes, I’m aware of the social/political POV that the majority of the characters are white. Just as I’m aware that I’m an Asian-American male watching the “Game of Thrones”. The last time I was directly involved in a film project was when I wrote & directed a short piece titled “Foreshadow” starring Doug Ming, Minh Do, and Melissa Capistrano with appearances by my good friends Jeanne Lam and Mary Tran. It was featured at a small fest gathering in collaboration with Revelcade Entertainment, which I chronicled here. The film is currently not publicly accessible anywhere but you can find a couple of clips from it on my film reel on YouTube. Reason being, also, I don’t have as much time as I use to as a kid, watching the latest movie or show because we didn’t have Internet back in the days, and my time was controlled to consume media by when something is scheduled on TV or in a theater. Now, because of the Internet, nothing is restrained. I can watch almost anything, anywhere, anytime. People with a phone is producing their own shorts, films, podcasts, etc., which I believe is a good thing. It’s become more democratized and not an elitist thing to produce a piece of work of expression. But, for me, a lot of this stuff is crap. I end up sifting through a lot of stuff until I can find one gem, and that’s a lot of time management to spend. But, I do hope you make the time to watch out for my crap this coming year.